Our galaxy is not what we thought it was. According the paper Rings and Radial Waves in the Disk of the Milky Way—published in the Astrophysical Journal—we should call it the Corrugated Cardboard Galaxy, as shown in the diagram above. Even more surprising: It's 50-percent larger than previously thought. According to Heidi Jo Newberg—professor at the Rensselaer Polytechnic Institute and lead author for this paper—"in essence, what we found is that the disk of the Milky Way isn't just a disk of stars in a flat plane—it's corrugated. 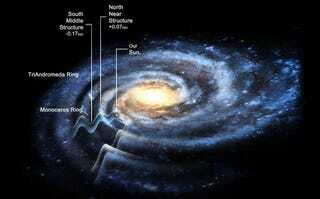 As it radiates outward from the sun, we see at least four ripples in the disk of the Milky Way. While we can only look at part of the galaxy with this data, we assume that this pattern is going to be found throughout the disk." We show that in the anticenter region, between Galactic longitudes of 110∘<l<229∘, there is an oscillating asymmetry in the main sequence star counts on either side of the Galactic plane using data from the Sloan Digital Sky Survey. This asymmetry oscillates from more stars in the north at distances of about 2 kpc from the Sun to more stars in the south at 4-6 kpc from the Sun to more stars in the north at distances of 8-10 kpc from the Sun. We also see evidence that there are more stars in the south at distances of 12-16 kpc from the Sun. The three more distant asymmetries form roughly concentric rings around the Galactic center, opening in the direction of the Milky Way's spiral arms. The northern ring, 9 kpc from the Sun, is easily identified with the previously discovered Monoceros Ring. Parts of the southern ring at 14 kpc from the Sun (which we call the TriAnd Ring) have previously been identified as related to the Monoceros Ring and others have been called the Triangulum Andromeda Overdensity. The two nearer oscillations are approximated by a toy model in which the disk plane is offset by of the order 100 pc up and then down at different radii. We also show that the disk is not azimuthally symmetric around the Galactic anticenter and that there could be a correspondence between our observed oscillations and the spiral structure of the Galaxy. Our observations suggest that the TriAnd and Monoceros Rings (which extend to at least 25 kpc from the Galactic center) are primarily the result of disk oscillations.